With good reason. The “hope and change” promised by Barack Obama that drew millions of disaffected blacks, Latinos and youth to the polls six years ago—the prospect of ending the occupations of Afghanistan and Iraq, closing the Guantánamo torture chamber and improving the living standards of working people—has proven to be less than hollow. The U.S. has embarked on yet another imperialist assault in the Near East, Guantánamo thrives, repression and surveillance under the “war on terror” have fresh legs. Workers and the poor continue to get ground down despite the “great recovery.” Millions across the country are scrambling to get by, one paycheck ahead of eviction, often working two or three jobs to make ends meet, standing in lines of thousands at job fairs offering employment for a hundred at most. And once again they are offered the chance to select between the two parties of capital, Democratic and Republican, that oversee their misery. The Republican candidates openly revel in their pain, hoping to seal greater electoral victories by disenfranchising poor and black people through voter ID laws. The Democrats, who pretend to be different, also carry out anti-labor, anti-black, anti-immigrant programs. Most people couldn’t care less whether the Democrats maintain control of the Senate, which is the main issue on tap. Not so the AFL-CIO tops and other pro-capitalist labor statesmen who yet again are stumping for the Democrats. The union bureaucrats’ lie that the Democrats are “friends of labor” is central to their whole program of class collaboration, tying labor to its class enemy and sapping its fighting strength. As black people continue to be gunned down by the cops across the country, the killing of Michael Brown in Ferguson, Missouri, and the brutal suppression of protests that followed revealed the real face of racist capitalist America. A New York Times (14 September) editorial, focused on drumming up the Democratic vote, chastised the town’s black residents for low voter turnout, proclaiming, “The cost of nonparticipation was a City Council wholly unrepresentative of the town’s population.” Al Sharpton and other black Democrats similarly berated black people in Ferguson, sending out the message that their oppression was their own damn fault. Amid the widespread disillusion and disaffection with the Democratic Party, a number of reformist groups on the left have thrown their hats into the ring. Still flush with excitement over the election of Socialist Alternative’s (SAlt) Kshama Sawant to the Seattle City Council last year, they are waging liberal reform campaigns either under their own banner or by supporting or joining bourgeois third-party tickets. None of these efforts represent, even in a partial manner, the independent class interests of the proletariat. It is the means by which the bourgeoisie disguises its rule with the appearance of a popular mandate. There is a crying need for hard class struggle against the rapacious capitalist rulers. However, in the absence of such struggle and with the working class lacking its own organized political expression, disaffection can go in many different directions, from political apathy to racist, anti-immigrant scapegoating to voters once again holding their nose and voting for the “lesser evil” Democrats. As revolutionary Marxists, our purpose is to translate discontent among the toiling masses into an understanding that the working class needs its own party, one that champions the cause of all the exploited and oppressed in the fight for workers revolution. In New York, International Socialist Organization (ISO) member Brian Jones is running for lieutenant governor on the small-time capitalist Green Party ticket headed by the Solidarity group’s Howie Hawkins. The ISO also endorses civil rights lawyer Dan Siegel, a bourgeois politician currently disaffected with the Democrats, for Oakland mayor. A similar politician in Chicago, the self-described socialist Jorge Mújica, is backed by a coalition of left organizations. SAlt’s Jess Spear is running for a seat in the Washington state legislature. In no way do any of these campaigns represent a break from bourgeois politics. Each puts forward at best a wish list of liberal measures—$15 minimum wage, police reform, rent control, increased taxes for the rich, environmental protection—variants of which have been bandied about by Democratic Party candidates as well. So housebroken are these “independent” campaigns that they utter not a peep of opposition to the bombings of Syria and Iraq or any other depredations of U.S. imperialism. 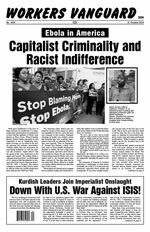 A particular lowlight of this electoral season is the support on the left for the “socialist” candidate for Milwaukee sheriff (see page 11). SAlt plays the same game by shining up the credentials of Vermont senator Bernie Sanders, a self-described “democratic socialist,” who caucuses with the Democrats and votes the Democratic Party line. SAlt fervently urges Sanders to run an independent campaign for president in 2016. Not even the ISO can stomach Sanders, with his support to Israel’s recent offensive against the Palestinian people in Gaza and his votes for the U.S. military budget. Describing Siegel, Sanders or the Green Party as “independent” makes it no more so than sprinkling some juniper berries in 16 ounces of water gives you a pint of gin. The campaign also boasts of the endorsement from the “venerable” Village Independent Democrats (VID), the first time this group has supported a third-party candidate. Hawkins/Jones pay special homage to the VID as “best known” for “starting Ed Koch’s political career.” As mayor, Koch was a voice of white petty-bourgeois rage against black people and labor. The Koch years laid a trail of horrors, beginning with the legions of black people killed by the cops—among them 67-year-old Eleanor Bumpurs and 25-year-old artist Michael Stewart. For Koch, the high point of his tenure was strong-arming labor during the eleven-day transit strike in 1980, during which he was conspicuous in whipping up racist animosity against the heavily black and immigrant transit workers union. We oppose on principle support to any capitalist party and stand for the complete political independence of the working class. We recognize that there are times when the intervention of revolutionaries into the parliamentary/electoral arena can provide a useful platform to put forward the Marxist program. This can include the revolutionary party standing its own candidates for legislative office and/or offering critical support to working-class organizations that draw even a crude class line. The misnamed “independent” campaigns championed by the fake socialists merit plenty of criticism—but no support. All of the current left campaigns cloak themselves in the short-lived Occupy movement’s mantra the “99 percent” versus the “1 percent,” a false construct that promotes the myth that everyone from the unemployed, shopkeepers, students and the police to wage workers share common interests. Predictably, as the 2012 presidential elections neared, the amorphous populist movement, which was wedded to pressuring the government for piecemeal reforms, in the main ended up occupying the Democrats’ campaign to re-elect Obama. We start from the Marxist understanding that society is divided into two main classes. The bourgeoisie is the tiny group of families that owns the banks, industry, mines, newspapers, telecommunications; the proletariat is the large section of society that must sell its labor power to the capitalists in order to live. The labor of the working class creates the profits pocketed by the obscenely rich owners. The interests of these two classes are diametrically counterposed—they cannot be reconciled. Social gains and political reforms that have benefited workers and the oppressed were not won through the ballot or in the courtroom, but were the product of tumultuous class and social struggle. By the same token, the capitalist rulers will seek to dismantle these gains, which must be defended by class-struggle methods.